We posted an article about this subject in March 2012 and received a huge response, with over 200 comments totalling some 30,000 words and hundreds of emails – this is certainly the biggest response to anything we have ever posted. A lot of the responses we got were based on personal experience and certainly showed a huge lack of knowledge and ability to assist left-handed children among teachers. This included responses from many teachers who felt they had not been given appropriate (or any) guidance in this area. We were hoping to get more feedback on the actual guidance that IS given in different parts of the world and information from teacher training organisations about what they DO provide but that seems to be singularly lacking so far! There is a general perception that teachers are not given any training or guidance in how to help left-handed children and from the feedback we have received, no evidence from anywhere that such guidance exists. A lot of people think that only if the teacher is left-handed will they have any idea of what is needed, and even that is not always true. There were many suggestions that all teachers should be made to perform the basic tasks their students face left-handed themselves to understand the issues involved. We did have some comments where people were happy with the level of support they received and from teachers (left-handed themselves) who feel they DO give a good level of support. However, this seems to be only exceptional individuals who have made a real effort to do something themselves rather than anything in the teaching and training systems. We thought you would find it interesting to see the actual comments people made so we have divided the best and most relevant contributions into different subject areas and published them on this site for you to review – see the links below. We are very sorry to say that none of this is new. We have been campaigning to get some basic guidance for teachers included in training programmes for decades. 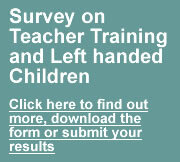 We had some success in the late 1990’s and had reassurances in the UK that guidance on left-handed children WOULD be included in teacher training and a small piece on left-handedness was included in the National Literacy Strategy document – you can see the background and results of our campaign here. But, sadly, it seems this never actually became part of real-world practice and has now faded out of use. A couple of teachers we spoke to who recently completed their training have told us they did not see anything specifically about left handed children and have not had any guidance since beginning teaching at schools. There seems to be an attitude of letting children get on with it and find their own way. We were hoping to get feedback from teachers and teacher training centres saying that there WAS guidance available and it was included in training for teachers. If that was the case, we would just need to encourage more people to use what was already there. In fact, what we are finding is that there is NOTHING available as guidance and advice for teachers regarding left-handed children and it is NOT part of the training teachers receive so that is a much bigger challenge! Parents of left-handed children being aware of the issues and guidance themselves and making sure the individual teachers looking after their own children are also made aware of it. Making head teachers aware of the information available and trying to get them to pass it on to teachers in their schools. Encouraging Local Authority education departments and other school management bodies to include it in their requirements for schools under their control. Asking teacher training facilities to include it in their curriculum for all new teachers. Contacting government education departments responsible for teacher training and schools management to find out about current guidance regarding left-handed children and making them aware of our recommendations. Presenting the ideas to national politicians and local government councillors and asking them to influence education providers to implement the available guidance. This is clearly a huge and very time-consuming exercise that will need to be pursued over a long period to get any results. We will be very interested in your views on this and particularly interested to hear from people who have time or resources to campaign on this issue in their own local school, area or country. Produce a concise document setting out the issues and and including a short questionnaire that parents can take to their schools for their children’s teacher or the school head to respond to. This will ask what guidance they have available, how it is used and whether we can have copies of any documents. We intend to have this available in plenty of time for the start of the new school term in September. Our document will be in English but we would appreciate any help from members in other countries who could translate it for us so we can make it available in as many languages as possible. We will encourage parents to download the document, present it to their schools and follow up to get answers then put those answers into a simple form on our website and attach and documents they have obtained. Send out a press release to raise awareness of this issue and make people aware of the questionnaire document. We will then collate all the feedback and decide on the best course of action from there, whch will definitely include producing a guidance document and updated video that can be used by teachers. Please add your thoughts as comments on this page or use our contact form to send a message direct to Keith.